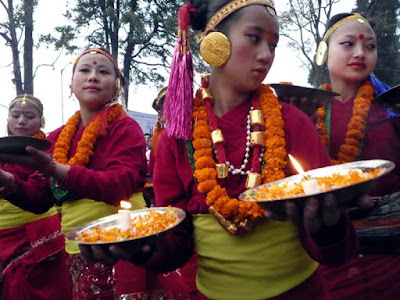 Darjeeling will host ‘Teesta Rangit Tourism Festival 2017’ from December 27 till New Year’s Eve after a gap of three years. The festival, which was organised from 2011 to 2013, was stopped by the Gorkhaland Territorial Administration (GTA) due to lack of funds. This year, the festival will be significant, both politically as well as economically, as it will mark, what Binay Tamang’s faction in the Gorkha Janmukti Morcha (GJM) hopes will be seen as the return of normalcy in the Hills after Darjeeling’s 104-day strike earlier this year for a separate state of Gorkhaland. What is more significant is the fact that a business meet has been planned in Darjeeling on December 28 for the first time as part of the festival. “The aim of the business meet is to see how Darjeeling can be developed economically and which industries can be brought here for investments. The principal secretary of the GTA is coordinating with the West Bengal government in this regard and a meeting was held at Nabanna (state secretariat) on December 4 to figure out the logistics. We don’t know which industrialists will be coming but the West Bengal government is likely to inform us by next week the names of the industrialists,” GJM leader Binay Tamang told The Sunday Express. Tamang added that they expect five industrialists from Delhi, Mumbai and Kolkata, besides others. “Darjeeling already has tea and tourism industries as its main sources of income. The areas where we are specifically looking at are the foothills of Darjeeling and the other Hill districts. Here we have land and it is possible to create an industrial hub. There are vacant plots within certain tea plantations that can be used,” said Tamang. The festival as well as the business meet have been conceptualised to convey a clear message from both the West Bengal government as well as the Tamang-Thapa faction of the GJM that not only peace has returned, but also on the sops planned for the Hills. “The tourism festival has happened before but never like this. In previous years, there were more locals involved in the festival. This year, we want more external participation, both in the number of outside tourists that we will hopefully draw, but also businessmen who want to participate,’’ Tamang added. While there is no confirmation yet, Chief Minister Mamata Banerjee may inaugurate the festival. GJM insiders said there are rumours that Bollywood superstar Shah Rukh Khan may also be called for inauguration. Several famous sportpersons, too, are likely to attend the festival, which will take place across the Hills — December 27 and 29 in Darjeeling, December 28 and 29 in Kurseong, December 29 and 30 in Kalimpong and December 30 and 31 in Mirik. The Himalayan Railway has been asked by the GTA to slash its prices for the toy train during the festival. Besides, hotels and transport department will be providing discounts and the Darjeeling Tea Association and Indian Tea Association have been requested to provide tea packets to tourists. During the inaugural ceremony on December 27, five torch-bearers from Darjeeling, Kurseong, Kalimpong and Mirik will run eight kilometers together from Jorebungalow to Darjeeling town, where they will light a ceremonial torch at Chowrasta in the heart of the town. “The tourism festival was one of the first things that the Binay Tamang faction had demanded from the state government during its bipartite dialogue. The fact of the matter is that while the tea industry has been affected very badly, it’s the tourism industry that has suffered the most in the Hills. There are barely any tourists in Darjeeling right now and November to January is one of our peak seasons. This is the time that the skies are cloudless and clear and you can see the Kunchenjunga through the day from all over. We honestly don’t expect many tourists to come despite all the perks. But at least it will send out a signal to tourists and visitors and hopefully things will pick up by next year again,’’ said a political observer. Teesta Rangit Tourism Festival 2017 - What is more significant is the fact that a business meet has been planned in Darjeeling on December 28 for the first time as part of the festival. “The aim of the business meet is to see how Darjeeling can be developed economically and which industries can be brought here for investments.